Vikki Hankins is one of about 1.5 million Floridians fighting for the vote — a right more difficult to regain under Republican Gov. Rick Scott than his GOP predecessor. Hankins, 43, served 18 years in federal prison for selling crack cocaine. Since her release in 2008, she has completed an associate’s degree, started a publishing company and run an advocacy group for criminal justice.Although Hankins has never voted, she said she’s earned that right. But she is frustrated and worried that regaining her rights — to vote, serve on a jury and hold public office — might not happen until she’s “50, 60 years old,” Hankins said. Florida Gov. 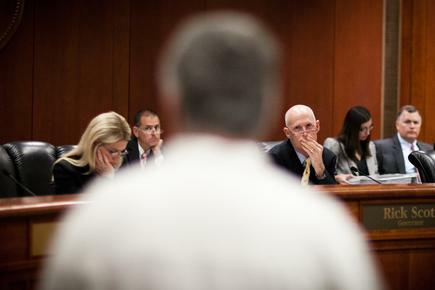 Rick Scott listens to testimony from felons attempting to restore their civil rights at a clemency hearing in Tallahassee, Fla., June 28, 2012. In Florida, felons must wait five or seven years after they complete their sentences to apply to have their rights restored. For some, it could take decades to be able to vote, while others may be permanently denied that right. 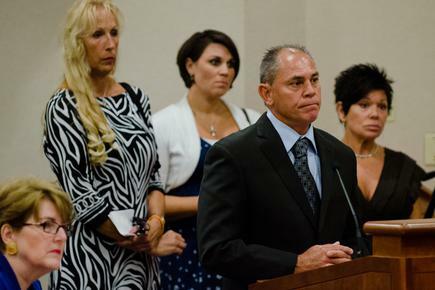 Members of the Florida Board of Executive Clemency, from left, Attorney General Pam Bondi and Gov. 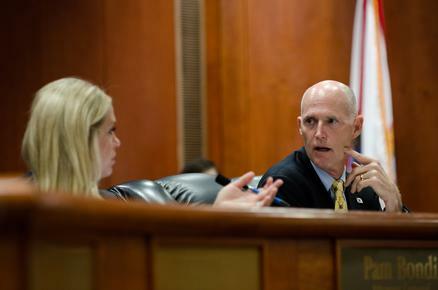 Rick Scott discuss whether a felon should be granted his civil rights. For felons to receive their rights, the governor and two of the three board members must vote in favor of restoration. Felon Anthony Greenwood pleads his case for a full pardon and to have his civil rights restored at a clemency hearing in Tallahassee, Fla. After questions and testimony from friends and family, Gov. Rick Scott told Greenwood that he would take his case under advisement. 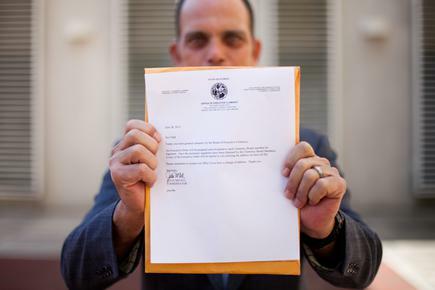 Felon Joseph Clark, 52, displays the document awarded to him after his civil rights were restored by the Board of Executive Clemency Thursday, June 28. Clark traveled from Arkansas to Tallahassee, Fla., to plead to have his civil rights restored after he was convicted of second-degree arson in 1988. Florida leads the nation in disenfranchising felons, especially African Americans. In 2010, about 520,500 African Americans — 23 percent of the state’s black voting age population — could not vote because of a felony conviction, according to The Sentencing Project, a Washington, D.C.-based criminal justice reform group. An estimated 5.85 million felons across the country could not vote in 2010, the last year for which The Sentencing Project has data. Florida’s process for restoring a felon’s civil rights grew stricter last year when Scott and his Cabinet — Attorney General Pam Bondi, Chief Financial Officer Jeff Atwater and Commissioner of Agriculture Adam Putnam — established a five- or seven-year wait, depending on the offense, before felons could apply to have their rights restored. In 2007, former Gov. Charlie Crist’s first year in office, 38,971 felons regained their civil rights. Last year, Scott and his Cabinet, acting as the Board of Executive Clemency, restored civil rights to 78 people. As of July 1, a backlog of 21,197 applicants awaited their civil rights, according to the Florida Parole Commission. The 78 felons who regained their rights last year is “not only low — it’s shockingly low,” said Mark Schlakman, senior program director for the Center for the Advancement of Human Rights at Florida State University. Schlakman is running as a Democrat in the Aug. 14 primary for the 2nd Congressional District, which includes the eastern panhandle and Tallahassee area. Scott, in a press release last year, said his policy is “intended to emphasize public safety and ensure that all applicants desire clemency, deserve clemency, and demonstrate they are unlikely to reoffend.” He denied multiple News21 requests for an interview. While felons could have applied to restore their civil rights under Crist, who served until 2011, a backlog that began accumulating in 2001 meant many cases were not reviewed while he was in office. In addition, the American Civil Liberties Union of Florida found through a public records request that 17,604 restoration of civil rights certificates have been returned to the Florida Parole Commission as “undeliverable.” Of these, 13,517 people have not registered to vote. Jane Tillman, communications director for the commission, said the undeliverable certificates are mainly for felons who did not request to have their civil rights restored, but qualified under clemency rules in effect under Crist. Tillman said there might have been around 30,000 undeliverable certificates, but the commission has worked to decrease that number. Within the last three months, all 17,604 cases were put into the online database available for felons to search, she said. Tillman said applications now are processed only if they meet Scott’s new criteria, including the waiting period. Otherwise, the applicant is contacted and told when and how to reapply. As of July 1, there were 1,056 applicants deemed ineligible. In 2001, the Florida Department of Corrections was sued for its “failure to assist inmates with the RCR (Restoration of Civil Rights) application process as required by law,” according to a report by the Florida Parole Commission. As a result of that suit, a state judge ordered the state to review the rights restoration of 150,000 felons. Tillman said this took about two years to process, during which time another backlog developed. For the first time since 2003, the Florida Legislature this year gave the Parole Commission money — $350,000 annually for three years — to process applications that do not require a clemency hearing. State Rep. Darryl Rouson helped secure that money. The St. Petersburg Democrat said he is passionate about restoring civil rights because he once battled drug addiction. His actions could have resulted in a felony conviction, but he got a second chance, Rouson said. Jessica Chiappone is also seeking that chance. She is vice president of the Miami-based Florida Rights Restoration Coalition, an advocate for education about and restoration of civil rights to felons. Chiappone, who applied to have her civil rights restored in 2008, graduated from Nova Southeastern University law school last year but cannot apply to the Florida bar until her rights have been restored. “It shouldn’t be this hard to become a productive member of society,” said Chiappone. According to the Federal Bureau of Prisons, she was convicted in 1999 of conspiracy to distribute cocaine. She calls once or twice a year to check on her application. This year, she was told her case was closed because the Parole Commission couldn’t contact her. She requested it be reopened but has not heard anything. Florida is one of three states — along with Kentucky and Virginia — where about 20 percent of African Americans could not vote in 2010 because of felony convictions, the Sentencing Project reported. “It certainly has a racially disproportionate impact, just as the criminal justice system has a racially disproportionate impact,” said attorney Dante Trevisani, a fellow at the Florida Justice Institute, a nonprofit civil rights law firm in Miami. But Hans von Spakovsky, senior legal fellow at The Heritage Foundation, conservative public policy research institute, said felon disenfranchisement is not racially motivated. Vikki Hankins, who is black, disagrees. While she wants to give Scott the benefit of the doubt, Hankins feels the changes that have so far kept her from voting may be racially or politically motivated. She feels she shouldn’t have to keep proving herself. But Hankins said she is determined to make it — to vote, continue her education and have a voice that is taken seriously by her legislators. For comments or feedback, email news@news21.com. 6 Responses to Should Felons Gain Their Right to Vote? I don’t see why they shouldn’t be able to vote, possibly their vote would go to reverse whatever law initially landed them in jail that was later seen as unjust. What do they think will happen? A bunch of felons will all vote to make bank robbery legal? I do agree with you. Once the individual is released from prison, he should have the right to vote even if he is still on parole or probation. The government will tax his income since he is a member of society again. The ex-inmate will pay income tax. The ex-inmate should have the right to vote. Felons should be permitted to vote especially if politicrats are using prisoners for re-districting purposes, funding, etc. By Chuck–Rights definitely should be restored after release from custody or parole. This is how it is done here in California. Those felons on probation never give up their right to vote. The fact that there is a lack of uniformity and an issue of voting rights is left up to the states rather than determined by Federal law is a travesty of justice and I find it surprising that equal protection arguments have not been made to address this issue or if they have I don’t know about it as I haven’t researched the topic.